Duncan Aviation has announced that an 18-year veteran of the company, Adam Beach, has accepted the position of Sales Representative for the Paint and Interior Sales team at its new Provo, Utah, facility. 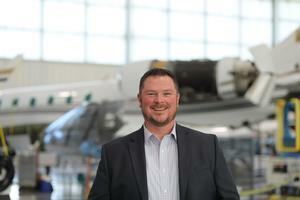 Although leadership and the technical side of the business are nothing new to Beach as he’s fulfilled various leadership and technical roles at Duncan Aviation for the last decade, sales is a new experience. With the expansion of the facility in Provo, Duncan Aviation opens its third full-service facility. The first aircraft arrived on January 4, 2019—a Global for its 120-month inspection—and with that, aircraft began rolling into the first new 43,000-square-foot hangar for a variety of work. For example, a Falcon 2000 is in Provo for an inspection, Automatic Dependent Surveillance-Broadcast (ADS-B) installation, and an engine change. A second Falcon 2000 is there for its three-year-airframe inspection and engine change, and a Cessna 750 is there for a dual engine change. As Michigan natives, Beach and his wife Amanda are fully integrated into their lives in Utah. Along with their four children, Ethan (13), Jazmine (12), Audriana (7) and Sadie (2), they enjoy camping, hiking, hunting, and fly fishing on the local, quiet streams.